Frente al Mar / Hot Tub / Hot Rock Sauna / Mascotas / 2 NGT min / sillas de ruedas. 'BEACHWALK' jacuzzi y sauna ROCA CALIENTE. Mascotas permitidas. Máximo de 6 personas, en todo momento y en cualquier momento, debido a la capacidad del sistema séptico. No invitado o fiestas. Edad mínima = 25. Vistas fantásticas, las más cercanas a la playa de todas las casas de la playa de Dillon, playa para perros Mascotas permitidas; los perros que se despojan se mantienen cepillados, no se permiten ladridos descontrolados, también si sale y deja a su perro solo y, por favor, no deje a su perro solo la primera noche y limpie la zona arenosa del pop dog. Dunas de arena, pozas de marea, pastos de dunas y magníficas vistas despejadas de la puesta de sol del Océano Pacífico. Una fantástica playa de surf. Mira las olas rompen en la playa y escuchar las olas mientras se está sentado en esta casa frente al mar. Gran lugar para los niños; hacer castillos de arena, explorar las ensenadas rocosas y pozas de marea en el extremo norte de la playa, búsqueda de lo desconocido durante la marea baja expuesta playa o jugar durante horas en las dunas de arena de alto. Surfistas Ver Parasail, pensionistas de surf, surfistas larga mesa o lo hacen todo por ti mismo. La playa perfecta sin rocas bajo el agua. Observar las estrellas no podría ser mejor. Traiga su telescopio! Deja que las olas engañar a dormir. Silla de ruedas no puede rodar hacia el exterior principal área de la cubierta debido a 3 pasos. Por favor traiga su propia leña para la chimenea; También hay calefacción eléctrica. No se proporciona jabón en barra, pero sí jabón líquido. BAÑERA DE HIDROMASAJE! ¡SAUNA DE HOT ROCK! MASCOTAS bien! Love this place. We look forward to returning every year! We had a relaxing stay at this ocean view home. The proximity to the beach couldn’t be beat and we loved the hot tub and sauna. We, also, loved being able to bring our dog. Ben checked in a few times to make sure all was well. It is an awesome place, amazing view! Great spot, gracious host. Checked in to make sure all was well and it was! Warm and bright house. Well laid out. Will rent again for sure! I am aware that some folks are hard on houses. It is well priced, clean, and well appointed. Our experience with this property was wonderful from the booking and throughout our entire stay. The house and property as well as location were perfect for our escape to the beach. Booking was so simple, the owner was a great communicator from the beginning and welcomed any communication needs during our stay. We were so greatful to be able to travel with our dogs and to be so close to an amazing dog friendly beach. Since the weather was little cool-it was so great to have a great hot tub and sauna to use-what a luxury. The house was clean and nicely decorated-we appreciated the nice beds-they were memory foam I think and very comfortable. And the house had everything we needed, just brought our own food and toiletries-easy parking too. Thank you for an amazing experience, we hope to be able to return in the future. Pictures posted on VRBO do not represent the real state of this home. This property needs repair! Great view of the beach and ocean from this ocean front home...that's about it. The couch is so stained, we had to put a blanket over it before sitting. The sliding glass entry door lock, doesn't work and you have to use a stick in the track to block the door. Fireplace heat is advertised, but the fireplace couldn't be used, as it was flooded with rain water (informed owner) and has a electric blower...water and electricity don't mix. The fireplace insert was rusted, indicating it has had water running into for quite some time. The ceiling in the living room, above the fireplace was wet and shows signs of water damage. Faulty electrical floor and wall sockets need repair. The gas heater for the home is central to the kitchen and living room only...no heat in the bedrooms. We did use a portable electric heater that was supplied, in one bedroom, but was hesitant because of it's worn cord and having to place it on a shag carpet floor. The backyard barbeque couldn't be used, because it had no cover is rusted and was full of rain water. The decking is weather worn and rotten in some spots...nothing like the photos posted on VRBO. For the money charged per night for this property...it should be in five star condition. I'm glad we only booked for two nights. Before anyone else stays at this property, the electrical and water leak issues should be repaired before somebody gets electrocuted. Yes, there was a monster rain storm with very high winds, that occurred, that is extremely rare. I offered a repair man to come to deal with the water that got into the fireplace but the renter refused. This house faces 7,000 miles of open ocean & the weather does work on the house but, the location is what people want & I do the best to maintain the house. This renter's review is not consistent with all other reviews. A solo una hora de San Francisco ya 40 minutos al oeste del país vino de Sonoma y Napa. Sentado en la boca de la entrada Tomales Bay, a través del agua del parque Nacional de Point Reyes. Bodego Bay se encuentra en la distancia al Noroeste. Ostras frescas en todas partes que se tenía. Tomales Bay es conocido como el más grande de ostras productoras de bahía en el norte de California. Ostras frescas y Bar-B-que me sirvieran están disponibles en áreas de picnic abiertas de la fábrica de la ostra; tratar Hog Island Oyster Company, en Marshall California a sólo 20 minutos de distancia! Age to rent =27. Holidays are 3 night minimum. 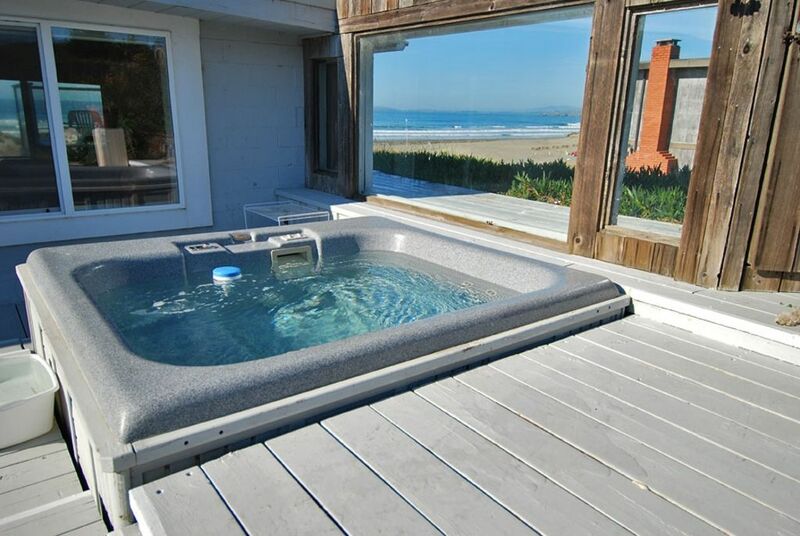 **NOTE** Traveler's must call the day before arrival so that property owner will give driving & check in instructions*** Ben Ross PH# 415-492-0211 Pet Fee $25.00 Per Pet If hot tub water is to be changed due to use- a 50.00 fee will be charged.